 Talk back: What do you think of Winston-Salem? A decline in major industries and having once been dubbed one of the "worst places for singles" (by Forbes, in 2001) might slow some cities down, but not this central Carolina town. Rolling with the changing times, Winston-Salem has shifted its economic focus from tobacco, textiles, and furniture to biotech, supply-chain logistics and product distribution. 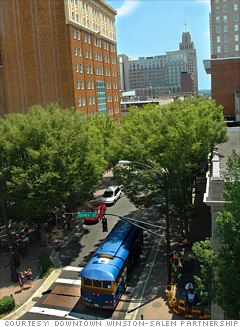 Entrepreneurship in these areas is fostered through organizations such as the Piedmont Triad Entrepreneurial Network, the Winston-Salem Chamber of Commerce's Technology Council, and the city's small-business loan programs. Like its higher-profile neighbor to the East, the Raleigh-Durham region, Winston-Salem has its own research park, which houses tech-based start-ups in six buildings and has ambitious expansion plans. Wake Forest University helps fuel local medical and tech innovation. Find homes for sale in Winston-Salem, N.C.